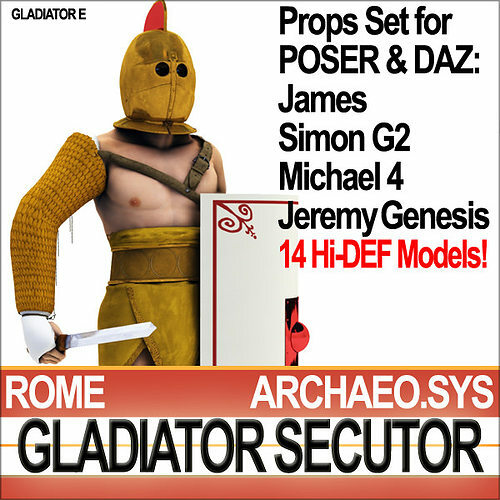 PROPS SET for POSER-DAZ James-Simon-Michael4-JeremyGenesis STANDARD CHARACTERS. CHARACTERS NOT INCLUDED. [DAZ is a free Software]. FOR POSER USERS: you find the characters James and Simon G2 always included in your Poser Package from version 6 to the newest version Pro 2012. You can have also James as a G2 version free from Poser Producer. FOR EVERY USER: This product always works also with DAZ and DAZ Genesis Characters. DAZ is a Full Free Software. SmartCgArt is member of the Archaeological Institute of America [AIA] and of the American Philological Association [APA]. The beloved Ancient Rome Gladiator Secutor [the chaser]. 14 HD 3D models for POSER James-Simon G2 & DAZ Michael4-JeremyGenesis. Faithful, accurate Reconstruction. C4D, 3DS, OBJ, POSER, DAZ, from VUE6 to 10. The best loved Roman Gladiator Secutor [the chaser]. The Roman Emperor Commodus, the main character of the Ridley Scott's movie 'Gladiator', was trained and fought as a Secutor, his armour and decoration being gold rather than bronze. Real World Scale Model [SmartCgArt Real World System]. Quads [C4D; OBJ; POSER/DAZ] & Tris [VUE;3DS]. Collection of 14 3D Models with 44 Photoreal and Alternate textures. 4 complete Props Sets ready to be used with POSER [James, Simon G2] and DAZ [Michael 4 character, Genesis Jeremy][DAZ is a free Software]. Faithful and accurate Reconstruction of a Roman Gladiator Secutor Props Set, according to the Scientific Data and the Archaeological Evidence. The Gladiator Secutor was, with the Murmillo, the best loved gladiator. He was usually a regular opponent of the Retiarius. Retiarii, in many cases, were considered the 'scum' of the arena and cowards. 19- Real World Scale SmartCgArt Man Reference System with models [C4D, VUE, 3DS, OBJ, DXF].